I've never really been into wreath making. I don't know why exactly. I guess it seems like a lot of work for little payoff. A typical wreath is so small. But with Halloween coming up I've been lamenting how drab our entrance has been looking these past few years. With four small children I really should have a more festive front porch. So I decided to make a wreath this year but I wanted it to be a focal point. Pretty large. I searched all over and the biggest wreath form I could find was only 16". Lame! Even ones online only go up to 24" and then they get exponentially expensive due to shipping size limitations. So I thought about it and figured out an easy, inexpensive way to make my own large wreath form. At first I thought about using two pieces of large cardboard and cutting circles then stuffing newspaper between them and using tape to keep it all together. But aside from that being super messy it doesn't really allow you to use the sides as well. This is what I finally came up with. I went to JoAnn's and found a 2' wide foam 3" thick. I bought 2' of the foam and all together it came up to $30 BUT I used one of their 50% off coupons and dropped down to $15! And pssst....those of you with a smart phone....did you know you can download the JoAnn's app and use that to have the cashier scan their coupons. And there's always one available and you never have to remember to bring one with you. The same goes for the Michaels smart phone app. I also bought burlap in black and white. They didn't have orange so I had to dye my white burlap but it takes dye so well. I only had to leave it in the mix for a couple minutes. 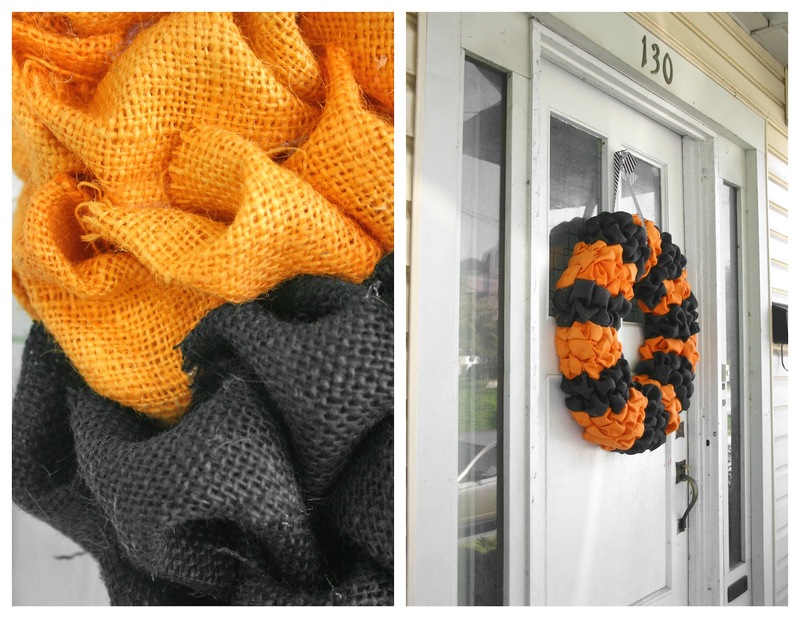 See the tutorial below to find out how I made this very large 30" wreath for only $35! Foam from JoAnn's is usually only 24" wide but you can also make up to a 48" wreath form if you took two foams and cut two half circles using the tutorial below and secured them together with a combination of glue and duct tape. Step 1. Get a 2', 3" thick foam from JoAnns. Use a coupon. Step 2: Find the middle of the foam. Measure lengthwise. Step 3: Then measure widthwise. Mark your middle. 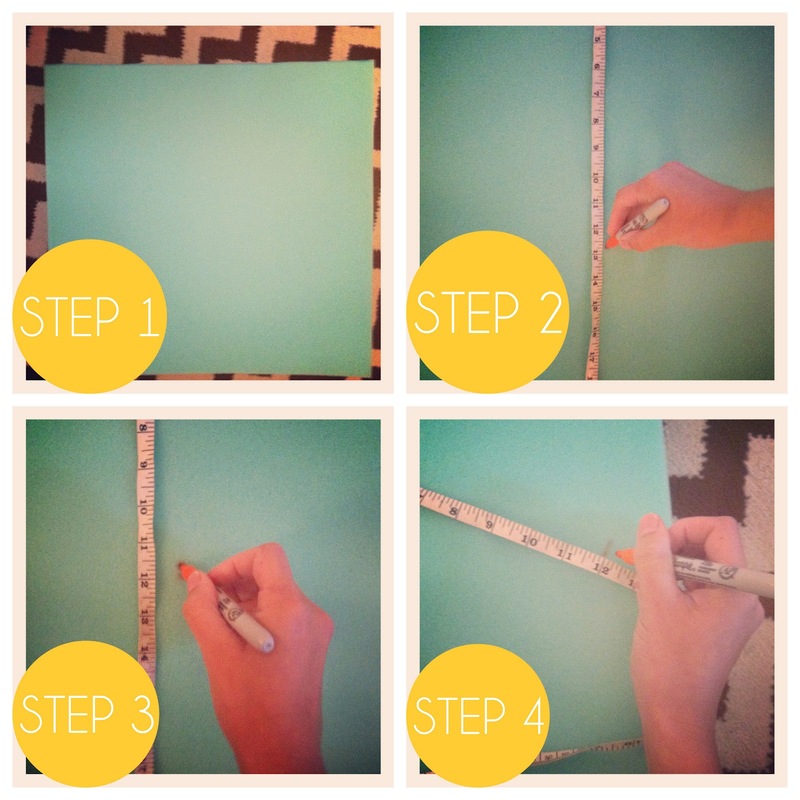 Step 4: Measure 12" out from your middle in every direction and make marks in the shape of a circle. Step 5: Connect your marks to make a circle. Step 6: Cut out the excess. I used a regular pair of scissors but mine are large and sharp. Little ones won't work. Step 7: Measure out 7.5" from the from your middle in every direction and make marks in the shape of a circle. 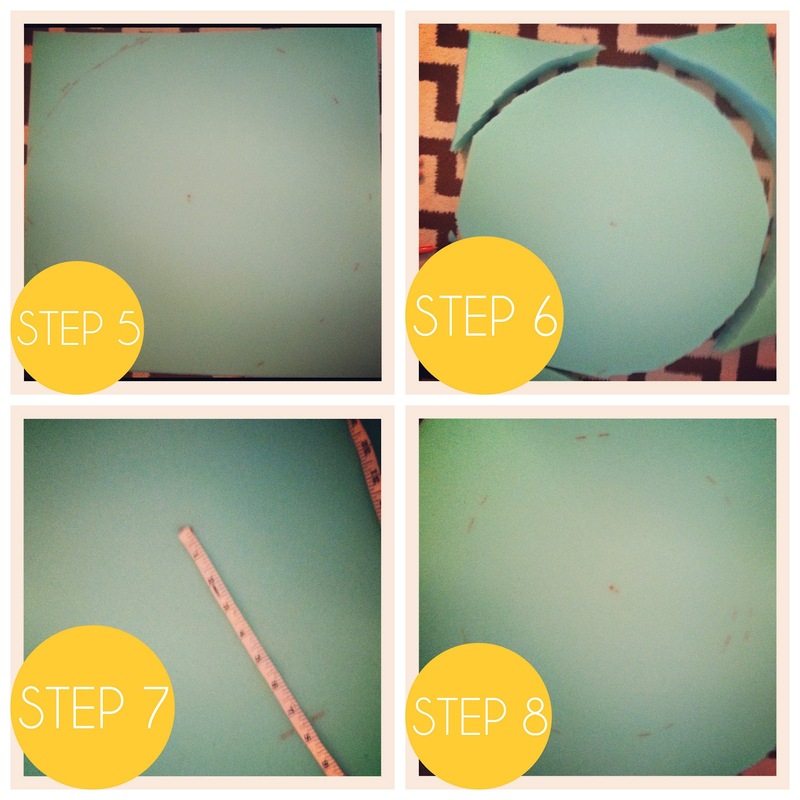 Step 8: Connect your marks to make a circle and then cut out excess like you did in Step 6. Now you have your 2' wreath form. Now for the burlap. Step 9: Buy 2 yards of white burlap (or orange if you can find it) and 2 yards of black burlap. Cut them in 5" strips. Step 10: Then cut those 5" strips into 5" squares. 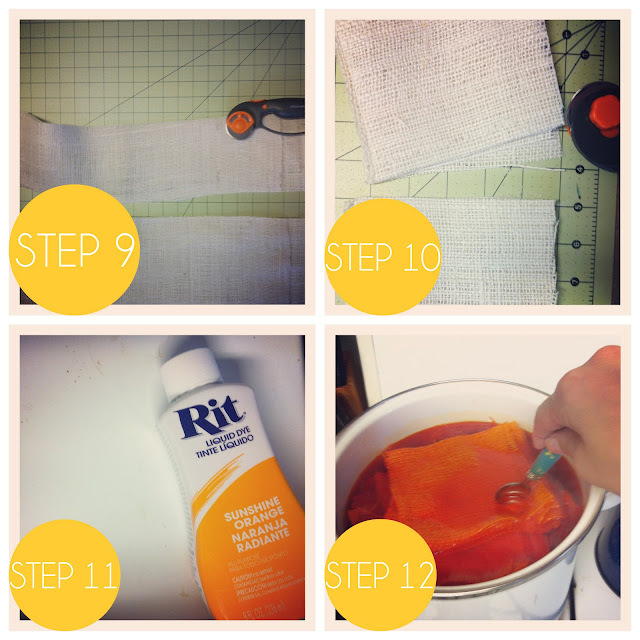 Step 11: If you couldn't find burlap use Sunrise Orange RIT dye to dye your white burlap. Step 12: Fill a pot of water large enough to fit all of your fabric and pour about half of the bottle into the water. Bring water to a boil. Then add your fabric. Let boil for about 3 minutes. Take out to dry. The burlap doesn't have to be completely dry to start the next steps just not sopping wet. Step 13: Take a piece of burlap so that the corners meet together at the bottom. Step 14: Use hot glue to keep those corners together. I recommend using rubber gloves while using the hot glue. The burlap has a very wide weave and the glue tends to get through and touch your fingers. ALSO, I recommend gluing all the burlap pieces you have FIRST. Then moving onto step 15. It saves a lot of picking up and putting down the glue gun. 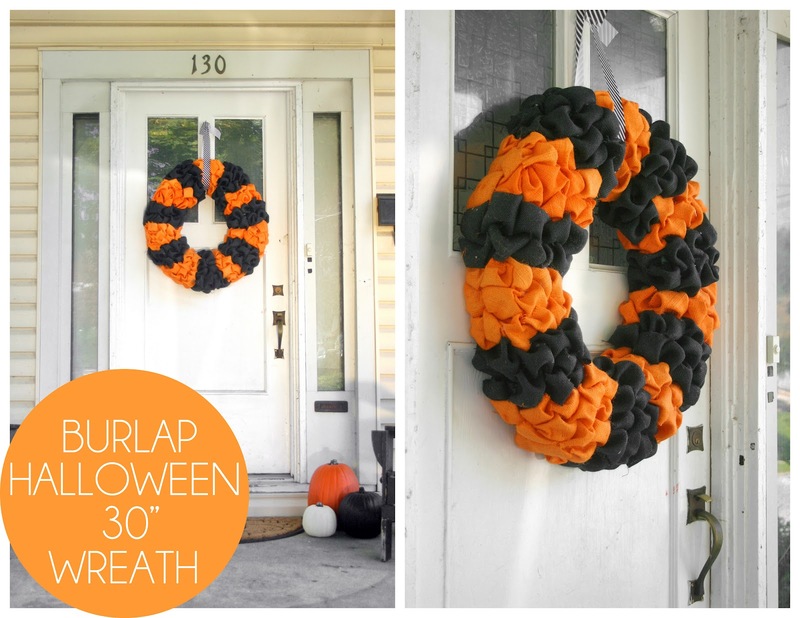 Step 15: Using straight pins, pin your burlap to your wreath form. Then hot glue down to wreath form. 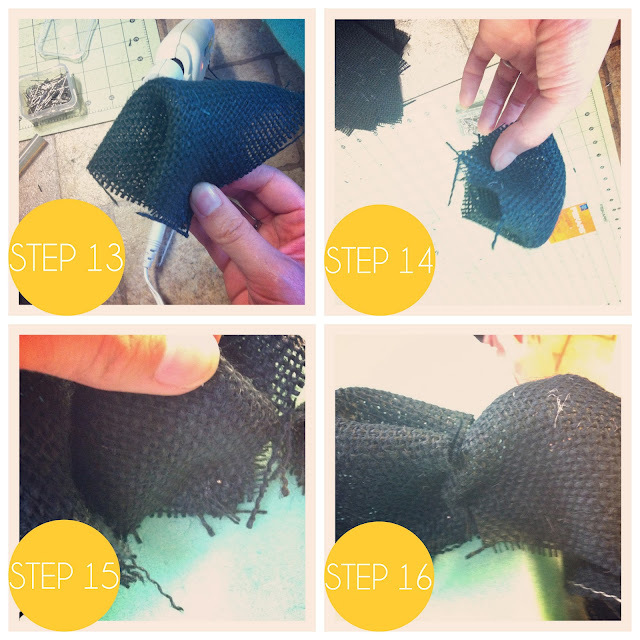 Step 16: If you want to make a striped wreath, pin the black burlap in a straight line. Then switch to an orange straight line. Make two lines if you want a thicker strip. ALTHOUGH since the wreath is in the shape of a circle your stripes should be more of a triangle shape. Another idea would be to opt for making a random black and orange pattern. Just add burlap without making stripes.